At Motor City Electric Co., we love what we do and we’re great at it. There’s only one thing we pride ourselves on more than our work and that’s employing talented individuals. The partnerships we create with our employees are second to none and these individuals are truly the heart of our business. That’s why we’re so dedicated to giving our professionals all the necessary tools they need to succeed in their careers. MCE is always looking to add talented, driven, and passionate individuals to join our team. We support a positive work-life balance and create a partnership with our employees by creating a cooperative work environment with great benefits. If you believe that you’re a hardworking, dedicated, forward thinking individual who loves to learn new things on a daily basis and you’re ready to grow your career, MCE is the place for you. Learn about our company culture (internal link to company culture page) and how building a great future with MCE is possible. 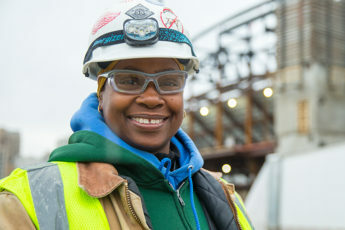 Motor City Electric Co. complies with all applicable laws requiring equal employment opportunity to all qualified individuals in its recruitment, hiring and employment practices. As part of this policy, MCE will not discriminate on the grounds of race, religion, gender, national origin, age, height, weight, marital status, veteran status, disability, or other factors as proscribed by applicable law. This policy applies to all employment practices including recruiting, hiring, pay rates, promotions, and other terms and conditions of employment and termination.